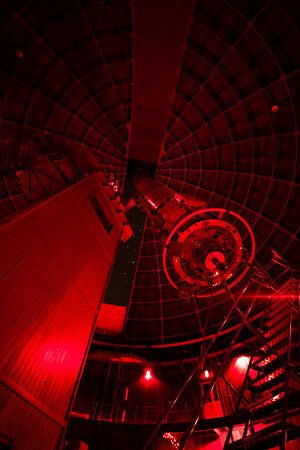 Sign up to be notified of future Great Lick Refractor viewing and imaging events. 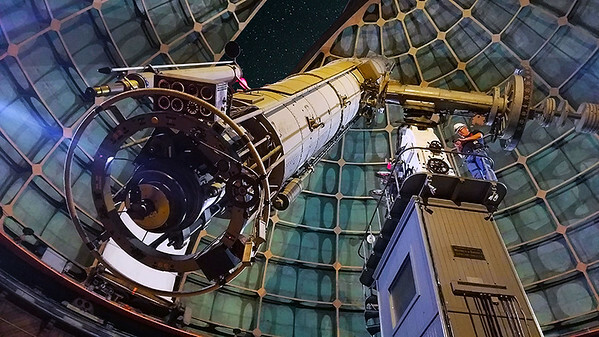 In 2017, we're capturing the cosmos using a Canon 6D DSLR camera attached to the 129 year old Great Lick Refractor -- a 36 inch refracting telescope at the Lick Observatory atop 4,265 ft. Mount Hamilton near San Jose, California. This project was funded by Kickstarter (The Great Lick Refractor) on March 20th, 2017, and will consist of 3 or 4 trips to the telescope throughout the year to use the power of its massive lens. The experience and findings will be shown below. Finally we caught a break during a week of on and off rain. Sunny, clear skies prevailed on this day, however, the wind was still strong, and would prove to be a challenge throughout the night. 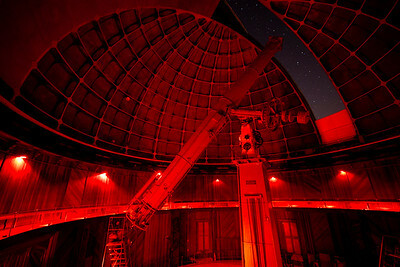 This being the second time we've imaged through this giant telescope (we first tested our methods for 3 hours in November 2016), we were hoping to gain more knowledge of its astrophotography capabilities through the only way possible -- trial and error. 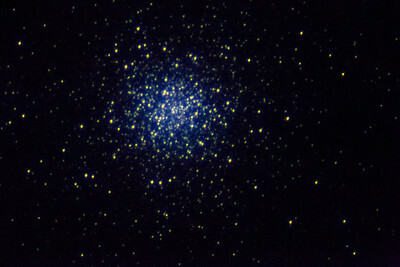 As many of you may know, aside from some preliminary calculations one can make - some definite, some approximate - trial and error is a key component to mastering any astrophotography setup, and so it's what we've set out to do with the Great Refractor. We know its 129 year old lens isn't perfect, as it suffers from some amount of chromatic aberration, which means it focuses the red and blue spectrums of light slightly apart from each other, creating a "fringe" around the edges of objects. We also know that using its effective focal length of ~17,000 mm will produce images that are much more "zoomed in" than our much smaller 8 inch, 1000 mm reflecting telescope, and this can make judging our image quality more difficult as it's much different than we're use to. 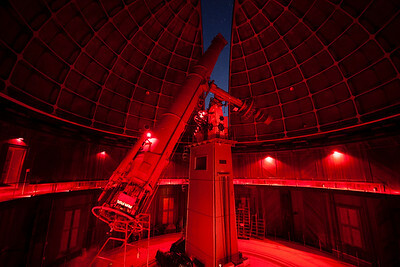 But we do know that at 36 inches, this thing has light gathering power like we've never seen, and the fact that we can put a modern day DSLR camera on the end of a 57 foot long, 129 year old telescope is just awesome! Now back to the weather... at dusk the skies were clear, but the wind was gusting to 20 - 30 mph, which shook the entire dome from time to time. 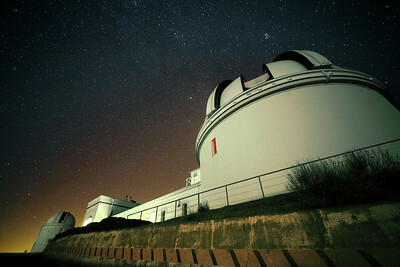 These are the obstacles you have to battle doing astrophotography. Nothing new, except for the much more limited time we had on this gigantic beast, as opposed to the endless nights we've had to trial and error our personal setup. 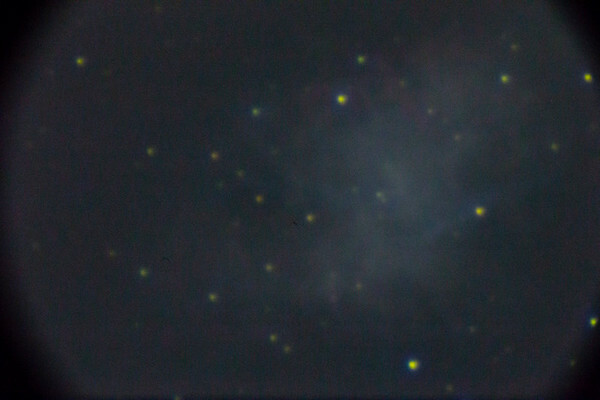 As the first quarter moon began to set below the view of the telescope, we pointed at Messier 1 -- a supernova remnant which was before just a tiny spec when we used our 8 inch telescope, but the Great Refractor would have it filling up almost the whole frame. The Canon 6D does really well at high ISO, and we didn't have much time with this object as it was quickly setting below our field of view, so a whopping ISO 20000 was used with 45 second exposures. The Great Refractor has a tracking motor, but no autoguider, so we were happy to get such long exposures without having the stars trail. One thing that is hard to get used to, though, is that the stars do not become pin-pointed -- no matter how much the focus is adjusted. It's just the nature of this telescope. As already mentioned, the specs of the this telescope are just way beyond anything we're ever seen, and we just have to get used to it. We'll continue to process the content we captured this night, and will report the results when ready right here on this page. Our next night at the 'scope is coming next week, and as it stands now the weather is looking to be great. On this night we welcomed some of our backers from the Kickstarter project. The sky was completely clear and the temperature atop Mount Hamilton was mild after a very warm day. We began the night by looking at the first quarter moon, and before we settled in with the eyepiece, we dropped the camera in for some quick shots. 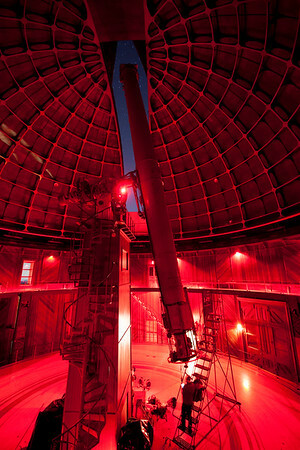 The Great Refractor's 17,000+ mm focal length provided an up close viewing experience of its surface. 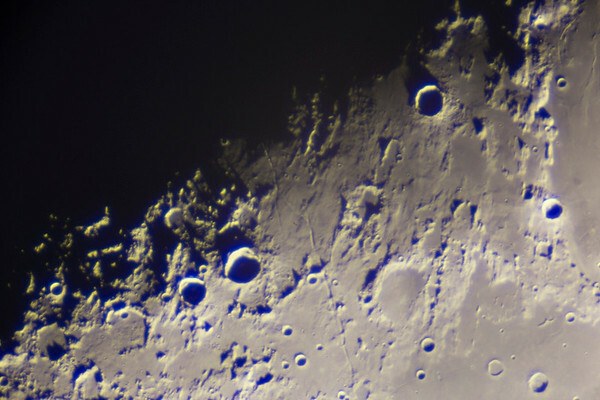 This sample image shows the chromatic aberrations from the 129 year old lens -- seen in the purpleish fringing near the edges of the craters, but overall we are very happy with the results. 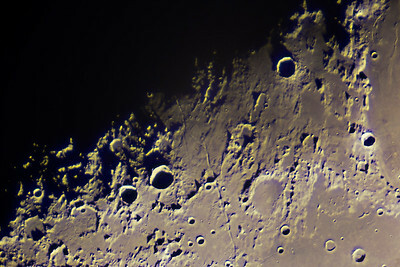 What an awesome close-up of our moon! Next, we'd put the eyepiece in and point the Great Refractor at a double star, and a faint spiral galaxy for everyone present to observe. 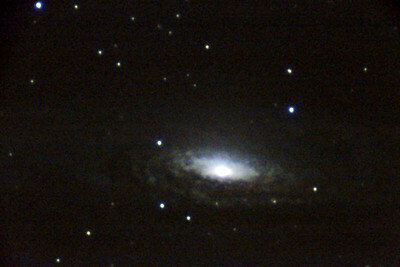 The double star was bright and straight forward, but the faint spiral galaxy required use of averted vision - that is - when you look slightly off to the side of an object and then view it "out of the corner of your eye." This method makes it easier for your eye to recognize the contrast of the faint smudge on the night sky, which is useful for viewing many galaxies and nebulae. 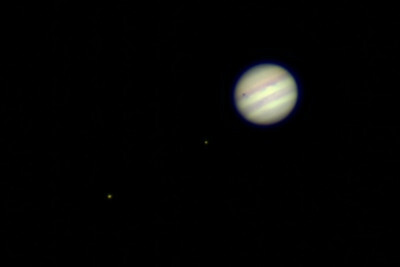 After that, it was time to point the 'scope at Jupiter. The conditions were much better this night than our previous trial on March 31st (described above). 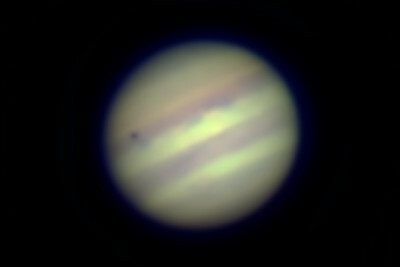 The wind was calm and the overall "seeing" of Jupiter was very good. "Seeing" is a term that refers to the amount of twinkling and blurring in bright nighttime objects due to Earth's everchanging atmospheric conditions. 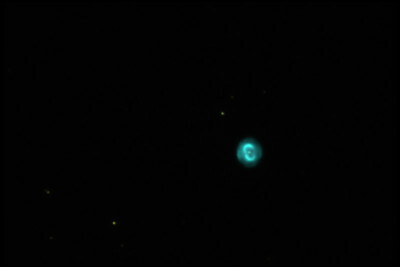 We captured several videos of the giant planet -- here are a few of the frames. 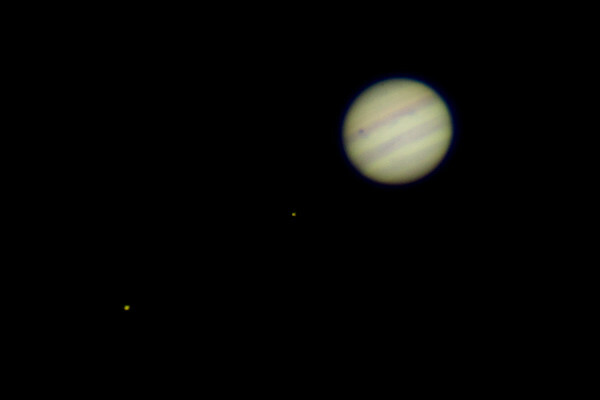 You can see one of Jupiter's moons, Io, transiting across the planet as a small black dot. 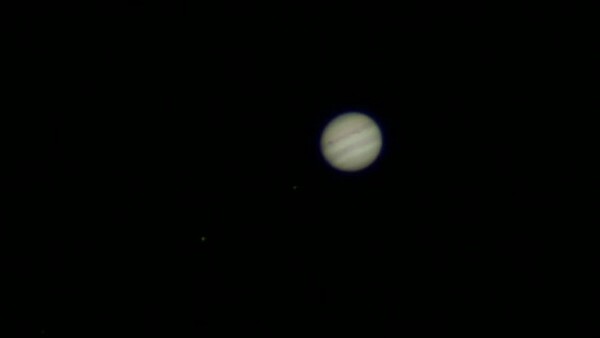 Below is video of Jupiter. For those of you who like to edit astrophotography, click here to download the raw video file (~25 MB) so you can edit it yourself! 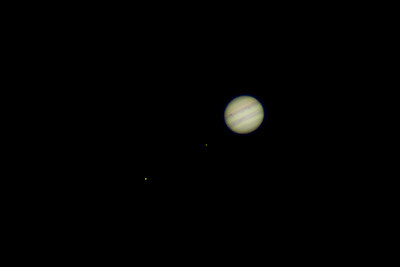 The spectacle of Jupiter was awesome. This telescope shines when it comes to viewing objects in our solar system as it really "takes you there." 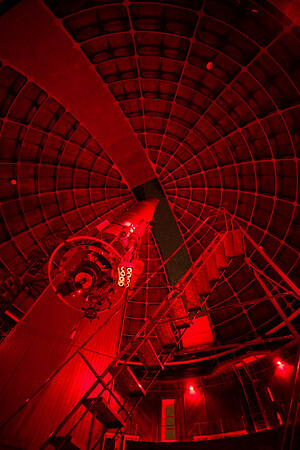 The third night posed some challenges as sundown began with weather conditions which were too humid to open up the observatory -- this to prevent any condensation from forming on the Great Refractor's lens. 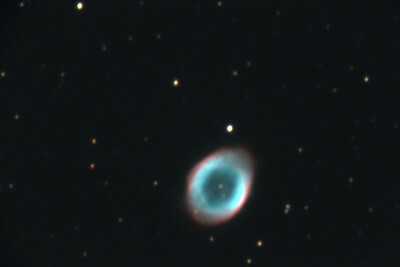 Our main target of the evening was to be M57 -- the Ring Nebula. It was positioned almost immediately overhead at sundown, so while we couldn't get started on time, we had some leeway to still be able to catch it in a good position to capture it. 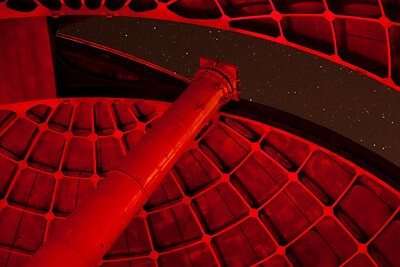 Almost 2 hours into the night, we finally caught a break when the observatory gave the go ahead to open the dome. We were lucky enough to be the only telescope on the mountain with the okay to do so due to the Great Refractor's robust character. 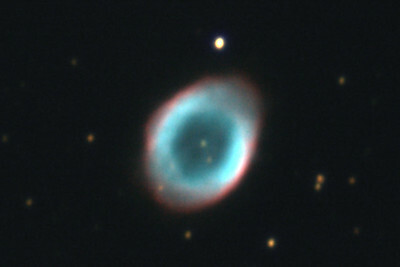 After our very helpful telescope operators zeroed in on M57, we dropped in the camera and began the tedious task of focusing on the object. 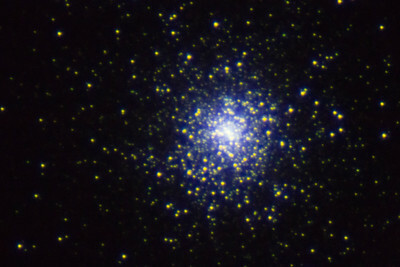 One of the backers of this project - Rick - who is also a Great Refractor telescope operator at Lick, has done some trial and error in getting a DSLR camera focused more quickly, and provided some good tips to minimize the time "wasted" trying to find focus. 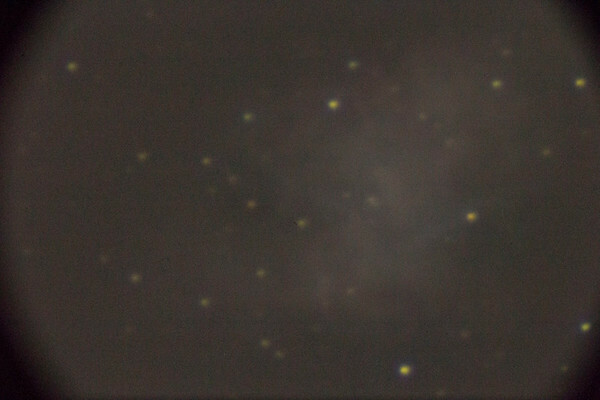 Once we had it as best as we could get - and anticipating a shutdown due to deteriorating weather at any moment - we immediately began a series of 30 second shots at ISO 12500. Sure enough, about 13 minutes into the set, the call was made to shut it down because of increasing humidity. This would end the night. 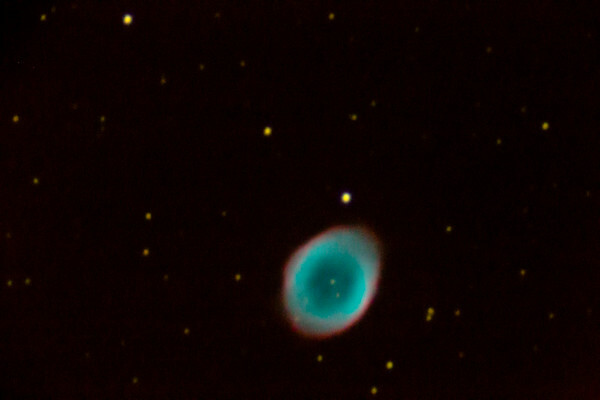 It was unfortunate that the weather didn't cooperate on this night as it had been mostly good on the first night, and great on the second night, but we still managed to get 20ish good shots of the Ring Nebula, which we think will edit nicely. And looking back, we're glad we got to use some extra time in those first two nights as it could've been worse had we booked an extra hour for this night instead. 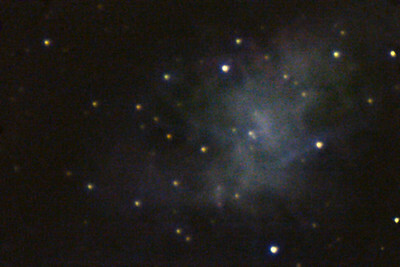 As we've experienced with the other shots taken through the Great Refractor so far -- the chromatic aberrations (soft, fringy focus on the edges) from the aging, imperfect lens are clearly there, but certainly not bad enough to be deal breakers in our opinion -- these shots are awesome and it has been a lot of fun capturing them! We don't have any concrete plans to visit the Great Refractor again, but we may look to image Saturn if it comes into a good imaging position in 2018. If that ever happens, we'll post an update here with the results.